Brand Ambassador Suzanne Posnett – Jumping in the sun has seen Suzanne bring home success. Brand Ambassador Suzanne Posnett updates her blog on her recent success and how her horses are performing during the hot temperatures. My main focus for June was the Portmore Equestrian three-day show. The recent hot weather has caused the ground to be quite hard, so I didn’t do as many shows as I would have hoped prior to this. I had a super successful show over the three days at Portmore. I took seven horses with me and stabled them all on site. I think the hot weather would have been hard on them to stand in a lorry all day, it was ideal to let them rest in a cool stable. Karmijn winning the 1.20m on Friday, 2nd in the 1.20m on Saturday and won the 1.10m Ulster Region on Sunday. Queen of Clubs won the 1.30m on Friday, 3rd in the mini Grand Prix on Saturday and had an unlucky 4 faults in the Ulster grand Prix on Sunday. Foesuela was placed in the 1.20m on Friday, won the mini Grand Prix on Saturday and had an unlucky 4 faults on Sunday in the Ulster grand prix. Carrickview Under Cover, Billy Flare, Orchard Echo and The Windmill Hero jumped lovely double clears in their respective classes and are making lovely progress. 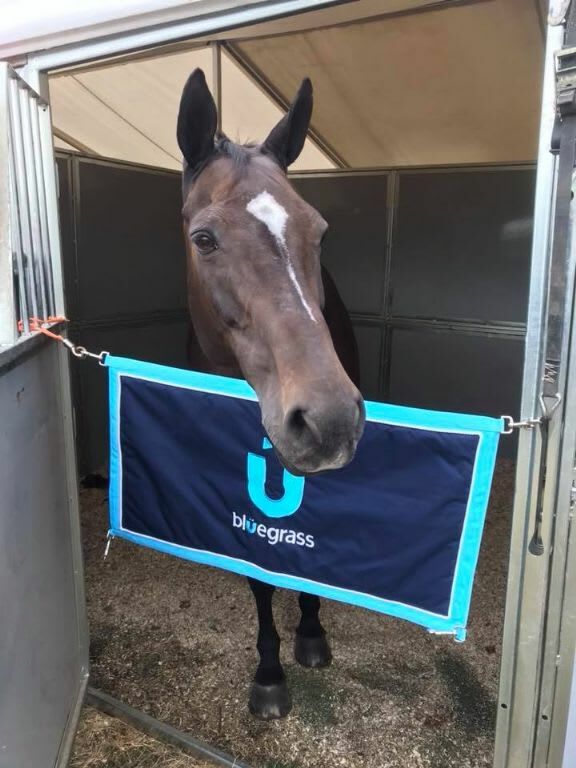 The show was a great success, the team at Pormore Equestrian kept the ground in great condition over the three days and had everything well organised as always. I travelled down to Omagh Agricultural show on 6th July to bring home more success with Karmijin winning the Top Oil- Fuelling Ireland Ladies Championship qualifier. I even manged to get a chance to catch up with Bluegrass Horse Feeds rep and feed consultant Craig Kileff at the show. The horses were on winning form as we packed the lorry and headed over to England for the Arena UK show at the end of July. I had a successful show, all my horses rode really well. On the Wednesday Queen of Clubs won her class and Karmijin won the 1.15 open, both of these fantastic horses won again on Thursday. Foesuela won the national 1.30m open on Friday and Queen of clubs came 2nd. The show finished on a high with Karmijin winning on the Saturday, with all the young horses jumping lovely double clears. When travelling a lot and stabling away from home your horse’s immune system can be lowered. To help manage this and keep my horses healthy, I feed Bluegrass Stamm 30. This balancer gives them a high-quality vitamin, mineral and protein content to their diet as well as yeast cultures to aid their gut and prevent gastric upset when travelling and when stressed at shows. For more information on this feed, get in touch with one of their feed consultants.